A dental implant is used to replace a missing tooth. 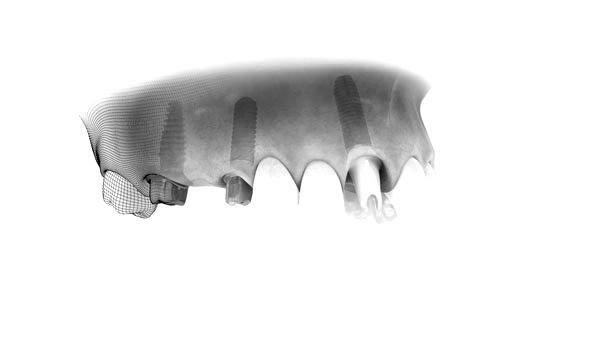 It is a metal root made of a biocompatible titanium alloy that is inserted into the jawbone. Its role is to serve as a foundation to support the new tooth (crown) that will eventually be made by a dentist. It is possible to support a complete dental prosthesis and to stabilize a partial denture using several implants. Once the implant is placed in the jaw, it is welded to the surrounding bone. It is so effective that some patients have implants in their mouths for more than forty years. Indeed, the first commercial system in oral implantology was commercialized in 1977. Dental implant placement is done under local anesthesia. It is also possible to benefit from intravenous sedation during this type of procedure. It is very rare that general anesthesia is necessary. In this case, the intervention must be done in a hospital setting. Following its placement, the implant gradually bonds to the bone. This is why a healing period of two to six months must be respected following the placement of an implant. The final restoration of the implant (crown placement) can only be done after this healing period. In many cases, it is possible to leave the clinic with a temporary restoration and thus avoid a smile without a tooth. If conditions alloys it, this restoration can be done directly on the implant. Otherwise, a transparent splint can support the restoration. Following a dental extraction, the bone that supported the tooth gradually resorbs over time. When the support bone has thinned too much and it is impossible to place an implant, a bone graft may be needed to rebuild the bone. Fortunately, new technologies often allow us not to use bone grafts. In addition, several teeth may be replaced with a smaller number of implants. To stabilize a prosthesis in the lower jaw, two implants may suffice. When it comes to supporting a complete prosthesis in the upper jaw, 4 to 8 implants are needed. Teeth removal is most often performed at the clinic under local anesthesia, with or without conscious sedation. In certain circumstances, general anesthesia may be necessary, and the procedure will be performed in a hospital center. The third molars, also called wisdom teeth, are four in the majority of people. They are located at the end of each dental arch, at the four corners of the mouth. These are the last teeth to erupt. The proper positioning of these teeth is often difficult given a lack of space in the mouth. They typically have poor orientation that further complicates their eruption and prevents them from becoming functional and useful. These teeth are most of the time erupting partially in the mouth, so called “semi-iimpacted”. Their distant position and the fold of gum that covers them is an impediment to hygiene, which promotes bad breath, local infections and loss of bone between the wisdom tooth and the adjacent tooth (periodontal defect). Wisdom teeth and adjacent teeth are also at risk for cavities. More rarely, it is possible that the wisdom tooth causes the destruction of the adjacent tooth (resorption). In some cases, the teeth remain completely included, that is, there is no communication between these and the bacteria of the oral cavity. Although hygiene is not involved in a case like this, there is a small possibility of developing a cyst or tumor around the wisdom tooth. It also happens that the wisdom teeth are resorbed, which eventually causes severe pain. For all these reasons, when it is indicated, it is preferable to proceed with the extraction of the wisdom teeth in a preventive or curative way, between the ages of 15 and 25 years. Indeed, it is shown that the procedure is more complex and presents more complications as the patient ages. The most common complications are post-operative infection and alveolitis. More rarely, extraction of a upper wisdom tooth may cause communication with the sinus, and extraction of a lower wisdom tooth may numb part of the lower lip temporarily or permanently. Surgeons at the Maxillo-Mauricie Clinic will help you make the best decision about your wisdom teeth: extracting or observing? When teeth do not cause symptoms, this is a dilemma that we face regularly. During the initial consultation, the surgeon will review the medical and dental history. Special attention will be given to any symptoms that the patient believes to be associated with wisdom teeth. A detailed clinical examination is then performed. The basic radiological examination is a panorex, but a three-dimensional radiograph may be recommended (“scan”). These images allow us, among other things, to evaluate the position of the wisdom teeth and their relation to the adjacent teeth, the sinus and the inferior alveolar nerve. The information gathered during the consultation allows the surgeon to agree with the patient on a course of action, taking into account the risks and benefits that each decision entails. You will receive detailed explanations of everything that concerns you. Wisdom tooth extraction is a simple procedure, but one that causes anxiety in most patients. This is one of the reasons we offer intravenous sedation, which allows the administration of drugs that relax effectively, in addition to reducing postoperative swelling and pain. Note also that local anesthesia allows a procedure without pain. Occasionally, some teeth (most commonly canines) get stuck under the gum and can not erupt in the right place. It may be desirable not to remove them. These teeth can be erupted through surgery, combined with orthodontic treatment. When the procedure is performed in the operating room (in a hospital center, under conscious sedation or under general anesthesia), the costs are paid by the RAMQ. This is a quite feasible procedure at the clinic under local anesthesia, but the patient must then pay the fees. An intervention that removes infection from the root of a tooth that has failed root canal treatment. The procedure is most often performed at the clinic under local anesthesia, with or without conscious sedation. Intervention to remove part or all of a lesion (tissue whose appearance differs from normal) to permit analysis and identification by a pathologist. The procedure is most often performed at the clinic under local anesthesia, with or without conscious sedation. In certain circumstances, general anesthesia may be necessary, and the procedure will be performed in a hospital center. Anxiety management method by administering sedative drugs (which help to relax without falling asleep completely).